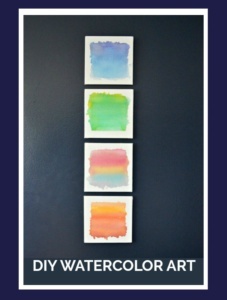 Easy Watercolor Painting Tips for Beginners! 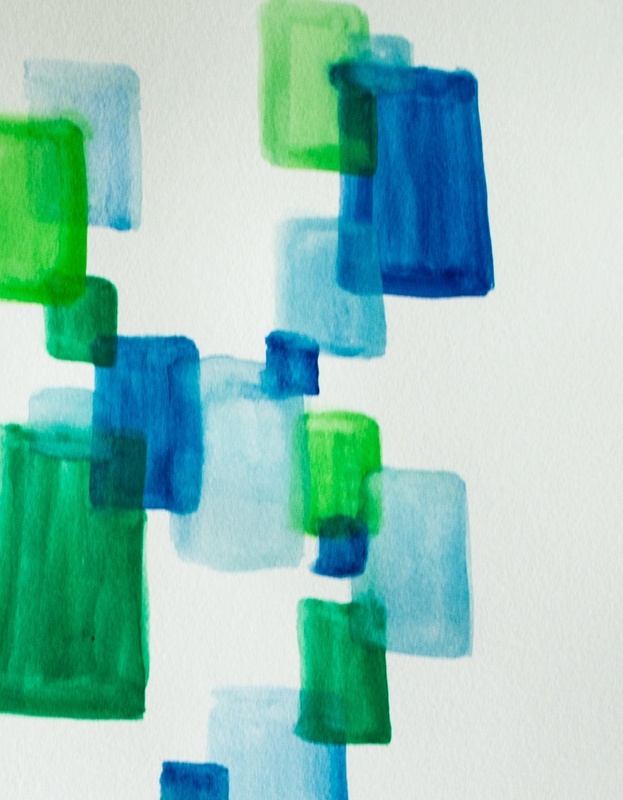 Watercolor painting seems like one of those things that should be super simple to do, doesn’t it? 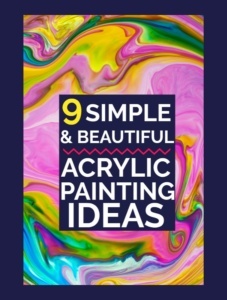 I mean you dip your paint brush in water, then you dip it in the paint and have at it, right? I learned this the hard way. 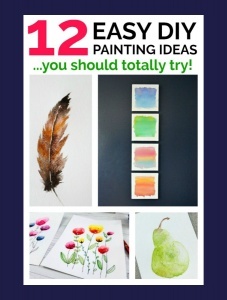 There are definitely some things you need to know before you pick up watercolors and just start flinging paint around. To get myself started on the right foot for this adventure, I took a beginner’s watercolor class from Skillshare. 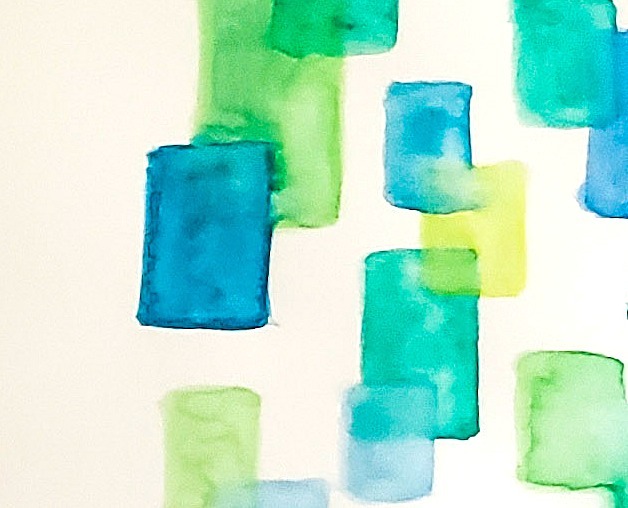 The class I took is Anyone Can Watercolor: The Basics for Creating Magical Pieces. It is a short class, 12 videos and only about 24 minutes. 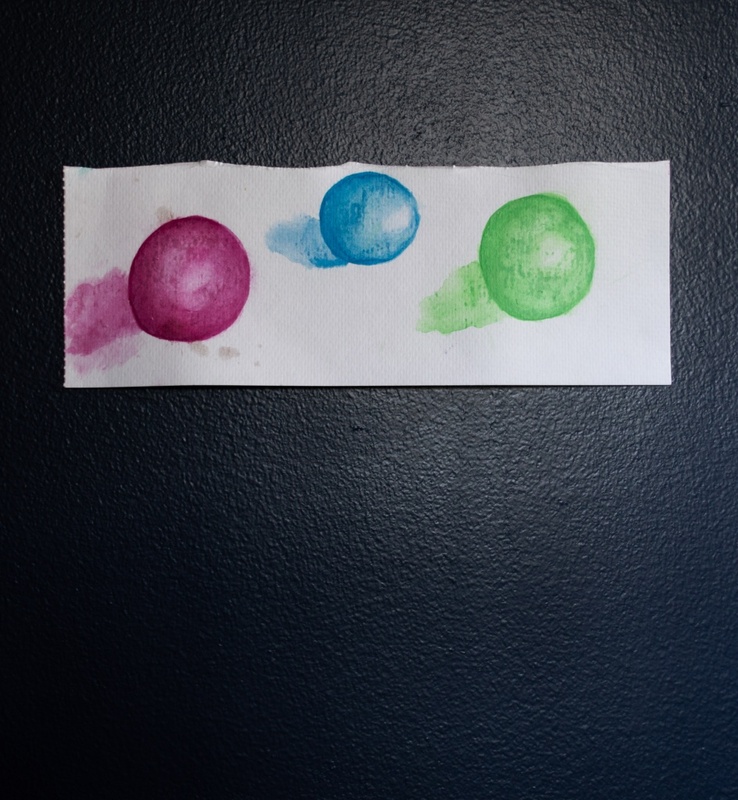 By the end of it, you will have a better understanding of the supplies you need for doing watercolors, the different types of washes you can create with watercolors and you’ll get to practice shading and blending by creating spheres. The spheres were really fun to play around with. I made a bunch before I started to get the idea of how the shading works and the different ways to experiment with blending. The final project in the class is a watercolor feather, which I actually haven’t tried yet because I was intimidated by the idea of drawing a feather, but I learned enough in the class to try a different project that was in the back of my mind, which I will show you in a minute. 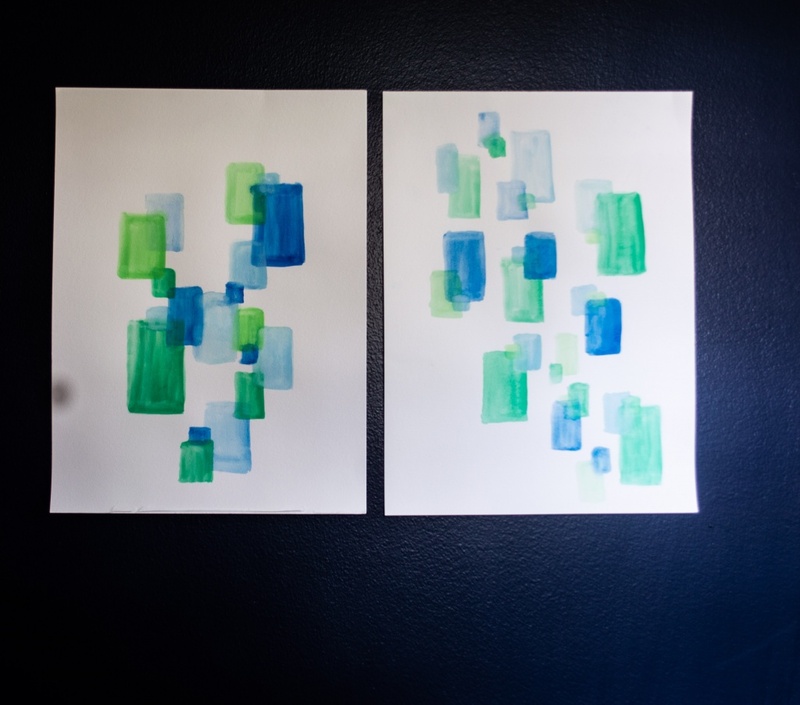 If you aren’t familiar with Skillshare, you should take a poke around. They have classes on thousands of different topics. 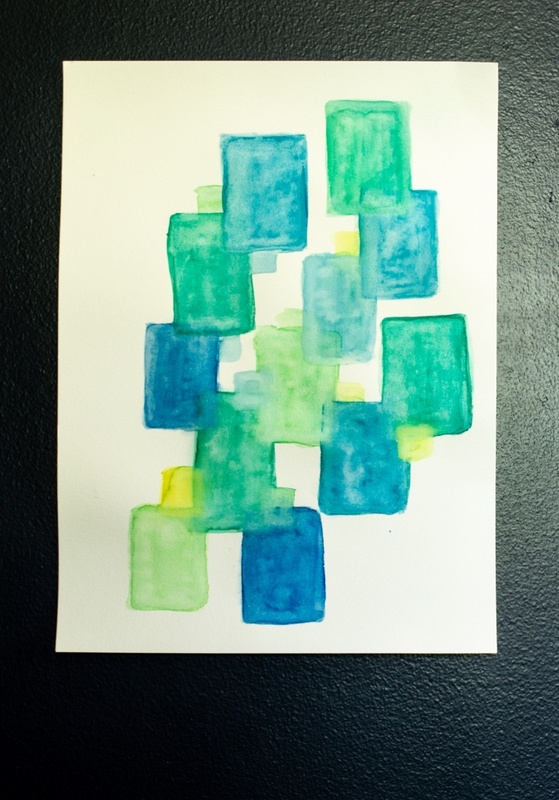 I’ve taken two photography classes, an HTML class and now this Watercolor Class. I love learning and Skillshare makes it easy. The classes are online and I can take them at my leisure. I can binge, or I can space them out. Whatever fits my schedule. Up next, I’m planning on a CSS class (which is blogging stuff), a Gouache painting class and I’m always looking to up my photography game, so I’ll for sure be taking more photography classes. The class that I took on Skillshare had great recommendations for what to use when starting with watercolor painting. Before I took the class, I had dabbled with some watercolors and I used cheapo printer paper, cheap brushes and cheap paint. When I did my final project, I used the specific brand, Canson, that the teacher suggested and it was fantastic! So much better than the other. 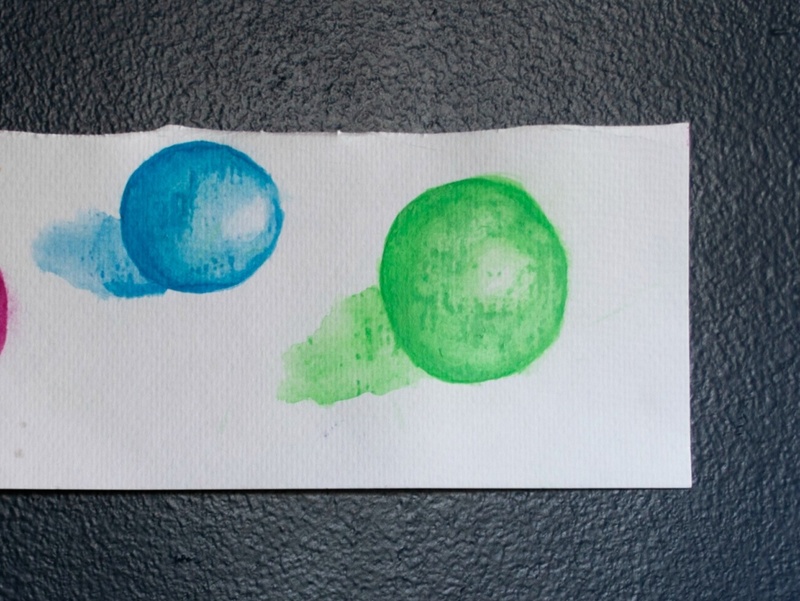 If you want to try watercolor, get the right paper. I haven’t upgraded my brushes or paint yet, but I will for my next project. The course instructor suggests starting with a couple of brushes that are made from squirrel hair, or synthetic squirrel hair like these ones and this is her preference for paint for someone starting out. If you’ve got good paper, some decent brushes and paint, then all you really need is some cups for water and some paper towels. There are extras you can experiment with, but this will get you started. Even after taking the course, I didn’t quite grasp just how much water you use when you are watercoloring. It’s more than you imagine it will be. 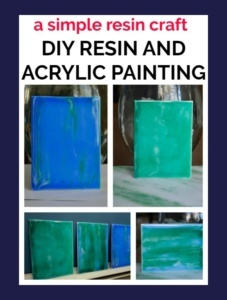 But water is what gives the paint that sort of dreamy effect that you are probably looking for when you are painting. It took me quite a few tries to understand this. And since you are using so much water, you have to plan for time to let things dry. 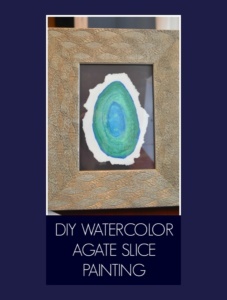 You’ll do a lot of layering with watercolors and often you want to do that when the first layer has dried. Sometimes you don’t have to wait, depending on the look you’re going for. The course reviews that and as you practice, you’ll get a better feel for it. I work from home as a community manager for a group of bloggers, many of whom are creative bloggers and crazy talented. My boss was showing me a member’s site (How Joyful, check it out, Joy’s stuff is AMAZING) and after looking at her hand lettering, I said, “I wish I was that talented at something”. It so happened that I had just finished my second try at painting that final project and I still wasn’t super happy with it. So, I decided to take his advice and try harder. I started the whole project over again. I even went back and rewatched some of the videos from the course. And the last painting I made is definitely the best one. So far. I still think I can try harder and I will. I want to try the upgraded brushes and paints and just keep practicing, but “Try Harder”, was some real honest to god good advice. I’m a little shy about sharing these, I’ll be honest. I mean, I post all kinds of things on here, but these paintings for some reason I’m a little hesitant about. I consider them a work in progress and the beginning of a journey, I guess. So, keep that in mind. They were inspired by this post on Pageflutter and my intention is to frame a couple for a little project I’m planning for our family room. So here goes. I’ll sort of walk you through what I didn’t like about each that made me want to keep making them. Ok, so this was the first painting that I made. You laugh and I’m kicking you out of here. OK, so the colors are mostly there, but the composition is like 5th grade art. Probably that is an insult to 5th graders. There’s nothing interesting happening in that painting. 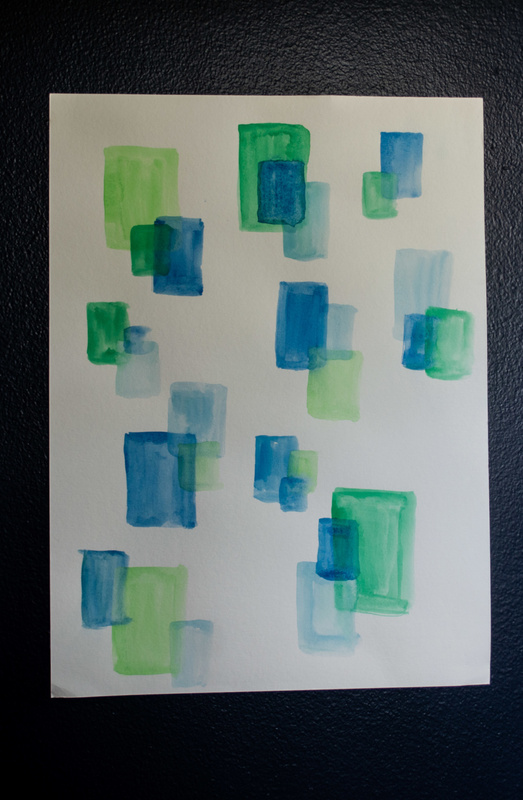 Also, brush strokes everywhere, which is not what I was going for. The next set, I worked on the composition. This, I have decided is the hardest part of watercolor painting. Ok, so a slightly more interesting composition. I actually really like the one on the left. The color saturation is nice. The one on the right is pretty faded out, not at all what I was going for. But I still didn’t have that great blurriness that I wanted out of the water colors. I tried two more times and got to a much better place. I still think that proper paint is going to make my next projects even better. This one is not bad. It has a lot more of that watercolor look that I wanted. The composition isn’t terrible. Unfortunately, the rectangles are too uniform in size for me. I wanted a mixture of sizes. I do love how the yellow pops in this though! So, I tried ONE MORE TIME! And I got this guy! The colors and the blurry watercolor look are exactly what I was going for. I’m 99% happy with this one. 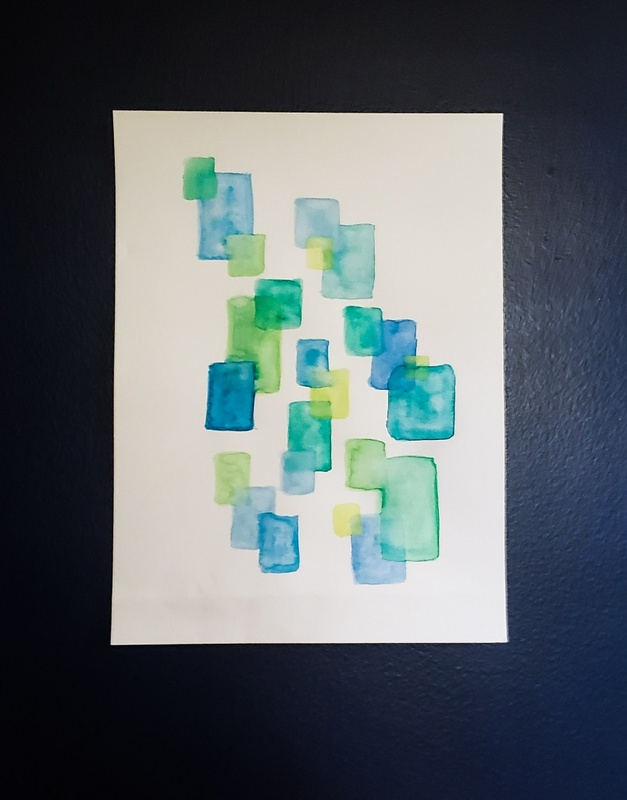 I do not like how the bottom is sort of a straight across line for the last few rectangles and I will try yet another iteration of this style of painting to see if I can get it more right. I do like that one very much though. Most importantly, I had so much fun learning the different techniques and experimenting. Watercolor painting is definitely something I want to keep trying! 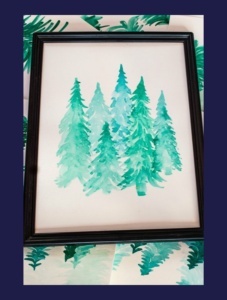 Here’s another super simple watercolor painting I made of a Pine Forest. I have a full tutorial with video in the post! Give this one a try. Now I want to hear from you! 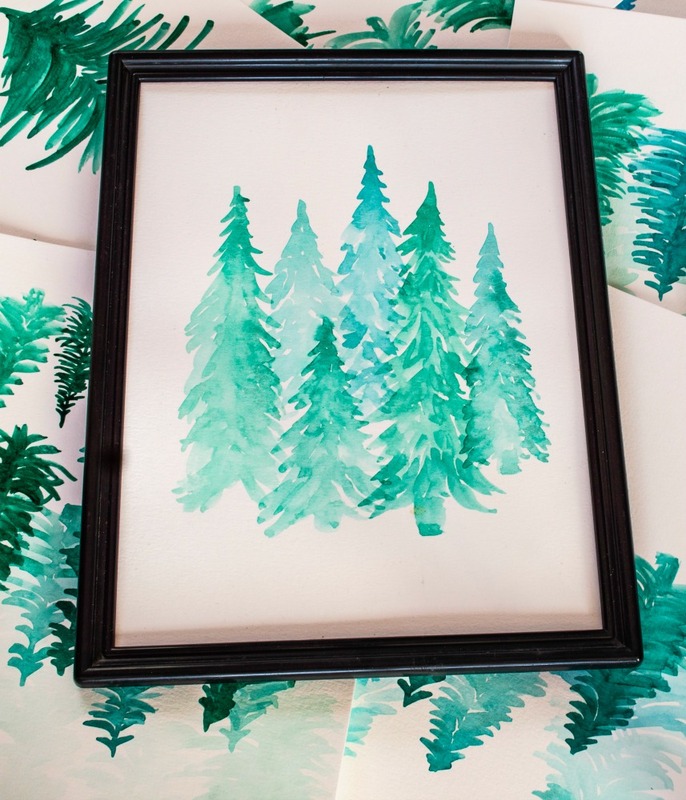 Do you watercolor? What have you made? 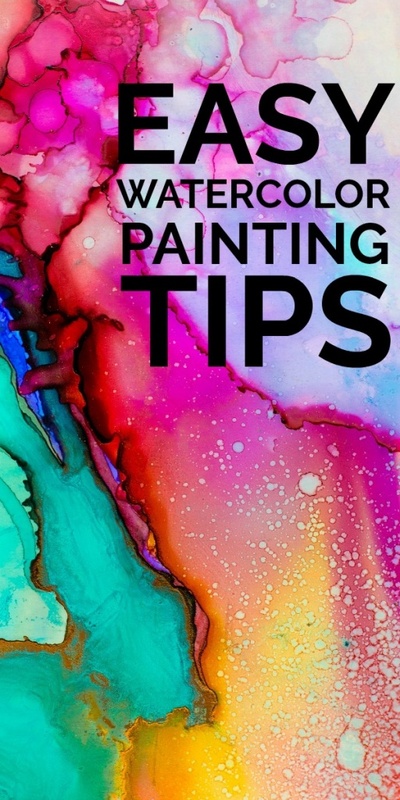 What’s your best watercolor tip?